A luxurious and powerful hybrid vehicle may seem like the stuff of mythology. But Infiniti seems to have found its proverbial unicorn with the M35h—the company’s first vehicle using hybrid technology developed exclusively in-house and not simply borrowing Toyota’s technology, as it does for the Nissan Altima Hybrid. The M35h falls between the M37 and high-end M56 in terms of price (and a high one it is, with an MSRP of more than $50,000). But the hybrid is almost identical to the gasoline-powered versions in appearance and offers all the same options packages (except for the Sport package), all the while providing better fuel economy than either gasoline model and more horsepower than the M37. The rear-wheel-drive M35h does all of this with its Direct Response Hybrid System, producing what Infiniti calls “the first true performance luxury hybrid sedan” to create a “true driver’s hybrid.” The Direct Response Hybrid system provides a 3.5-liter V6 DOHC 24-valve engine connected to a 50kW electric motor by an electronically controlled 7-speed automatic transmission for a combined 360 hp. The V6 produces 258 lb-ft of torque, while the electric motor supplements with 199 lb-ft of torque. The M35h can use the electric motor alone at up to 62 mph and can travel for up to 1.2 miles on electric power alone. And in mixed driving situations, the vehicle can travel in electric-only mode up to 50% of the time. According to Infiniti, this increases the amount of time that the car is operating in a zero-emissions mode, amping up its “green” street cred. Outside, the M35h offers standard 18-inch wheels, HID bi-functional xenon headlights (with available adaptive front lighting), standard front foglights, power heated outside mirrors, a power moonroof and dual exhaust in the rear. In other words, there is not much, other than the badging, to distinguish the M35h's exterior from that of its M37 gasoline counterpart. However, better fuel economy (27 mpg city/32 highway) and more horsepower (360 hp at 6,500 rpm for the hybrid system’s net power) make the hybrid version stand out from the M37. And this fun, fast car has produced 0-60 times of well under 6.0 seconds in road tests. Road tests did note one quirk: a slight pause when the accelerator pedal is floored while the car is traveling in electric-only mode at slow speeds. After the transmission downshifts, the M35h surges forward again. Under typical driving conditions, however, the car not only powers well, but handles well with the hybrid electric power steering—an on-demand system combining electric and hydraulic power steering to increase fuel efficiency while maintaining the feel and responsiveness of a traditional hydraulic system. The interior of the M35h offers a luxurious yet sporty feel. The Infiniti Intelligent Key unlocks the car on approach, as well as allowing for push-button start and memory for two drivers’ preferred settings for seat, steering wheel and outside mirror positions. The M35h seats 5, with typically luxurious interior appointments: Japanese Ash wood trim, leather seats (heated and 10-way-adjustable in the front) and an available heated steering wheel. Since it is a hybrid, the M35h does provide a unique instrument display for hybrid data such as battery information. The standard audio system features 6 speakers, AM/FM/CD with MP3 playback capability and speed-sensitive volume, active noise control (generating what Infiniti calls a “cancelling sound” from the door speakers to “reduce unpleasant engine harmonics”), a USB connection for an iPod and XM satellite radio (requiring a separate subscription). An upgraded Bose 10-speaker Premium audio system is optional, as is a 9.3GB hard drive for music and an in-dash CD/DVD player or an even more elaborate Bose Studio Surround system with 16 speakers, including two personal speakers mounted in the front seats. Other standard technology includes Bluetooth for hands-free phone use, the Infiniti controller knob (providing yet another option for controlling audio, climate, navigation and Bluetooth) and an auto-dimming rear-view mirror with Homelink universal remote. Options include a hard-drive-based navigation system; voice recognition for audio, navigation and the vehicle information system; as well as XM NavTraffic, XM NavWeather and a Zagat restaurant guide. One of the few criticisms leveled at the hybrid, however, is the reduction in trunk space (from 14.9 in the M37 and M56 to 11.3 cubic feet in the M35h)—a result of the compact lithium-ion battery pack placed behind the rear seats. The rear seats do not fold flat or offer a pass-through for long items, so storage options are limited for larger items. Safety features are plentiful in the M35h, including 6 airbags, antilock brakes with electronic brakeforce distribution and brake assist. 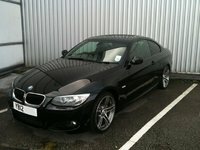 Traction and stability control systems are also standard. The approaching Vehicle Sound for Pedestrians (VSP) is new for 2012 with the hybrid. Since the electric motor can be stealthily quiet, the VSP system emits a variety of sounds to warn pedestrians that the vehicle is in motion, both when starting up and at slower speeds. Optional safety features include a Blind Spot Intervention system, which uses radar to alert the driver to other vehicles in the M35h’s blind spot with lights and warning tones. If the driver continues to move into the lane occupied by another vehicle, the car will automatically apply the brakes. Similarly, the available Lane Departure Prevention system uses a warning sound, and eventually braking power, to prevent the Infiniti from drifting out of its lane. In addition, a forward collision warning system monitors the distance between the Infiniti and a car ahead. If the M35h is approaching the other vehicle too quickly, a warning tone is sounded, followed by Intelligent Brake Assist, which applies the brakes pre-emptively to lessen the impact of a collision. Although the Infiniti M35h does have its luxury hybrid rivals, competitors such as the Lexus GS 450h, while offering similar acceleration times, can’t match the fuel economy, power or price of the M35h. The 2011 Lexus GS 450h, for example, posts estimates of 22 mpg city/25 highway, with 340 hp (total system) and an MSRP listed at $58,050. So for a sporty, powerful and engaged driving experience, you don’t need to be a princess to tame the Infiniti unicorn, only a driver looking for a clean, green hybrid luxury machine. What's your take on the 2012 INFINITI M35? Have you driven a 2012 INFINITI M35? 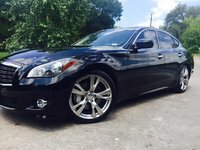 Looking for a Used M35 in your area? CarGurus has 447 nationwide M35 listings starting at $2,900.